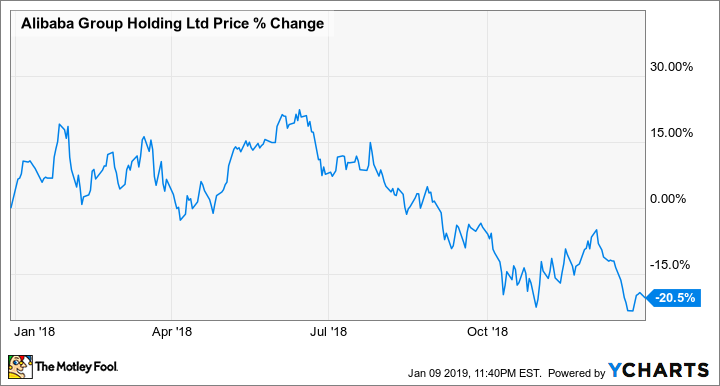 Shares of Alibaba Group (NYSE:BABA) slipped last year as the company fell victim to a broader slowdown in the Chinese economy, as well as trade tensions with the U.S. An earnings miss and guidance cut also cooled off the stock in the second half of the year. According to data from S&P Global Market Intelligence, the stock finished the year down 20%, slightly better than the Shanghai Composite, which fell 25%. As you can see from the chart below, Alibaba stock was actually up for much of the year, even gaining more than 20% at one point, but the stock slipped through much of the second half of the year as the Chinese economy slowed and Alibaba's earnings reports missed the mark. There was no single factor that pushed Alibaba's stock down last year, but the most significant one seemed to be the deceleration in the Chinese economy, as Alibaba is the country's largest e-commerce retailer and one of its biggest companies overall. A key purchasing managers index, for example, headed toward contraction over the second half of the year, showing manufacturing activity had started to decline. Overall economic growth also slowed as retail sales in November slipped to their weakest level since 2003. Trade tensions with the U.S. also seemed to be weighing on the Chinese economy as the U.S. slapped a 10% tariff on $200 billion worth of Chinese goods and threatened to raise it to 25%. As for Alibaba itself, its two earnings reports at the end of the year left something to be desired, and investors also were rattled by news that Founder Jack Ma would be stepping down as Chairman of the Board. Shares dipped 3% on Aug. 23 after earnings in its first-quarter report missed the mark despite a 61% jump in revenue. That was followed in September by news that Ma would step down as Chairman of the Board in September 2019 and be replaced by CEO Daniel Zheng, which pushed the stock down 3.7%. Ma said he would stay on as Executive Chairman for another year after that before yielding that post. Finally, the stock sold off on Nov. 2, falling 2.4% on its second-quarter earnings report, as Alibaba slashed its full-year revenue guidance by 4%-6%. The company said it would not monetize some of the inventory on its platform, giving a break to some of its merchants in light of the economic headwinds to build up the platform for the long term. Alibaba shares already are up 11% in 2019 as trade tensions appear to be thawing and global stocks have largely risen. However, trade negotiations are ongoing and may not produce the desired compromise, which would hurt Alibaba and other Chinese stocks. Elsewhere, the Chinese economy is expected to continue to slow, which could also weigh on the stock. Though Alibaba's competitive position remains strong, macroeconomic factors could pressure it again this year. However, the growth stock arguably is entering value territory as it's trading at a price-to-earnings ratio of 31, a cheap price considering the company's growth rate.